In Malagaholidays.com you have the option to talk with a travel operator by phone in your own language. She would recommend you depending on your needs and/or in what you are looking for. An example for this could be a person looking for a quiet and cheap hotel in Sierra Nevada, with a limited budget but looking also for the comfort of quality transportation to the hotel using an airport transfer or by renting a car. Malagaholidays tour operator, would take all those premises and based on that would choose the best option for the client...and talking the true, this can´t be done by an automated system yet. Prices are very competitive for apartments in Sierra Nevada, hotels and ski resorts. We can get our accommodation in Sierra Nevada for a low price, finding luxury and cheap hotels in Sierra Nevada is not that difficult now. Friendly support and instant payment options make of Malagaholidays an easy and pleasant experience in booking online, from car rental services, to hotels, apartments and transfers. Below we review some of the most popular Sierra Nevada hotels. We may be looking for cheap hotels or luxury hotels, but in first place, we expect at last a comfortable accommodation. The Hotel Mont Blanc in Prado Llano is located close to the slopes and also it is just 37 km from the city centre. So if you wish to enjoy the cultural city of Granada as well as the slopes we recommend checking this hotel availability. Hotel Mont Blanc Sierra Nevada. This hotel/hostel is not located close to the slopes, however the price for this hotel is cheap. This hotel is recommended for young people or families looking to enjoy Sierra Nevada and not spending much money in accommodation. The hotel is in a great location just a few meters from the main resort plaza and the cable car. You can reach the main ski lift / cablecar in just 5 minutes. If you are looking for a ski lodge atmosphere, then this is your hotel. Customers gave many appraisals to Hotel Ziryab so we think you will enjoy your holidays in Sierra Nevada. The rooms were refurbished in 2007, it is located just at 150 metres from the lifts. There are LCD TVs in each room and paid parking for your car. 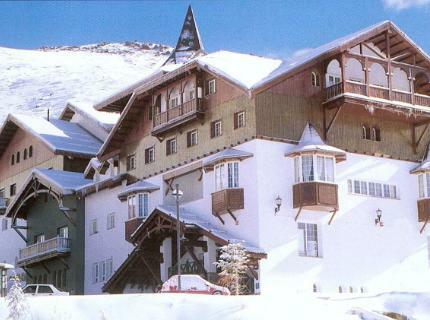 Melia Sol y Nieve hotel is a great option for skiing in Sierra Nevada for its location. Melia Sol y Nieve Hotel . This is the only 5 star hotel in Sierra Nevada, however many people complained about it. This hotel doesn´t have pool and it is a little far. The hotel building is old. As final words, our recommendation is to check Malagaholidays.com and try their service for Sierra Nevada hotels. You would not loose but get many benefits, so give it a try and let us know your experiences, we always hope to be of help in your holidays on the Costa del Sol. Many tourists prefer Sierra Nevada apartments instead hotels as a more personal accommodation; Sierra Nevada apartments may be the solution for those people looking for the comfort of a big saloon, a kitchen and a few bedroms for more than 2 people. Pradollano is the "capital" of Sierra Nevada, so the apartments there can´t be located in a better place. Close to the ski lifts and with great views of the Sierra Nevada in Granada. Located 8km from Granada city centre, it is one of the most complex ski resorts in Sierra Nevada. Explore the beautiful views and mountains of Sierra Nevada from Monachil. Get more information or make an online reservation for apartments in Monachil. There are shops, restaurants and amenities within this location. It is 15 to 20 minutes close to Granada. Apartments in Güejar are ideal base for summer activities/skiing in winter (25 to 30 mins to ski lifts). If you are looking for online availability of apartments in Sierra Nevada, please check out Malagaholidays.com website for apartments deals.